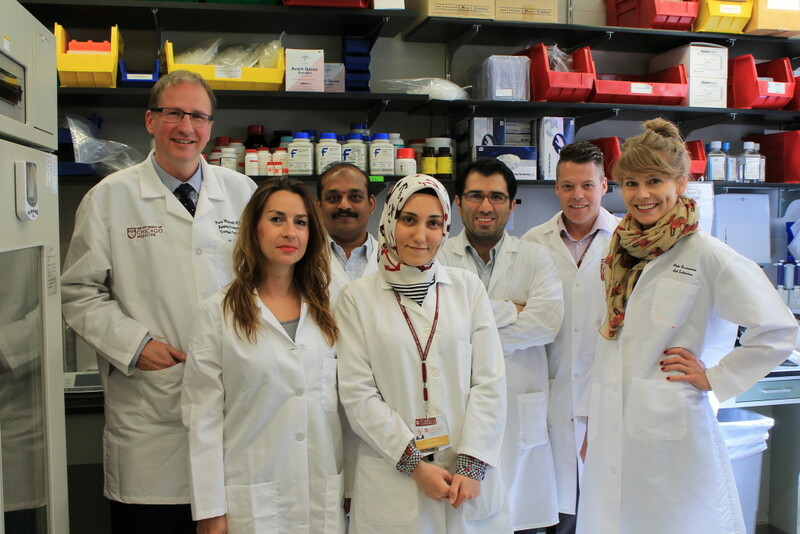 (L – R): Piotr Witkowski, MD, PhD; Karolina Golab, MS, PhD student, Treg project specialist; Sabarinathan Ramachandran, PhD, director of the islet isolation laboratories; Zehra Tekin, MD, postdoctoral research scholar; Omid Savari, MD, postdoctoral research scholar; Randall Grose, PhD, Treg project specialist; Paulina Langa, MS, visiting PhD student from the lab of Piotr Trzonkowski, MD, PhD, overseas. Photo by Sara Serritella. Between 14 and 22 million people in the United States suffer from autoimmune diseases, such as type 1 diabetes, multiple sclerosis, and rheumatoid arthritis, according to the National Institutes of Health (NIH), with the medical cost of treating type 1 diabetes and multiple sclerosis alone topping more than $7 billion each year. But with the help of an ITM Pilot Award, Piotr Witkowski, MD, PhD, is one step closer to curing those conditions – and ending the body’s rejection of organ transplants. In November 2010, Witkowski and his team initiated the development and optimization of expanding the number of regulatory T cells (Tregs)outside the body in his laboratory. Tregs are cells that hold the immune system in balance, preventing autoimmune diseases and the body from rejecting organ transplants. As part of this ex-vivo process, he collects the blood, separates the white blood cells through leukapheresis and grows the number of Tregs to 1,000 times the sample size in his laboratory. His goal is to use the data gathered from the ITM Pilot Project to gain approval from the U.S. Food and Drug Administration and Institutional Review Board (IRB) so they can collect Tregs, expand them in his laboratory setting, and transfer those multiplied Tregs into the patients they originated from as one of the first U.S. clinical trials of its kind. 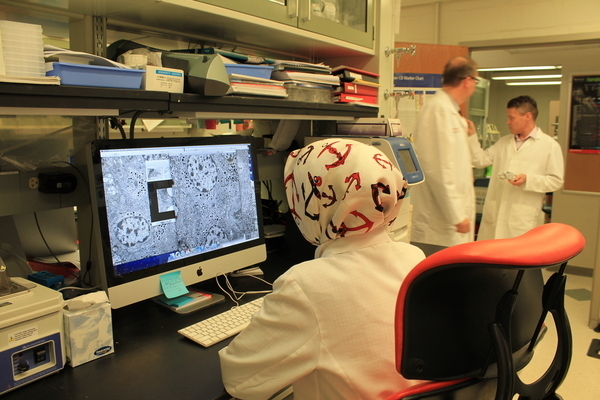 Members of Witkowski’s lab are trying to cure autoimmune diseases. Photo by Sara Serritella. One of Witkowski’s collaborators in Europe, Piotr Trzonkowski, MD, PhD, of the Medical University of Gdansk, implemented the world’s first successful human therapy based on ex-vivo Treg cell expansion. The duo is also working with Jeffrey Bluestone, PhD, a well-recognized immunologist and Treg leader who is also the executive vice chancellor and provost at the University of California, San Francisco (UCSF). Bluestone, who previously served as the director of the University of Chicago’s Ben May Department for Cancer Research, recently completed a Phase 1 clinical trial using Treg expansion technology in patients with new-onset diabetes using Treg expansion technology. While they are all collaborating, each of them developed slightly different Treg processing procedures looking for optimal conditions to achieve the same end product: pure and stable Treg cells in sufficient numbers. For example, Witkowski’s team uses leukapheresis to acquire Tregs from patients’ blood at the sampling stage, whereas Trzonkowski and Bluestone collect 500 milliliters of blood per patient and isolate the Tregs afterwards. And the extent of the expansion matters because of the different applications. Witkowski’s collaborators are focusing on patients who were recently diagnosed with diabetes and still have some healthy groups of cells, known as islets, that are producing insulin. Their goal is to protect those remaining healthy islets from complete destruction by infusing patients with their own Tregs that were expanded in the laboratory. In contrast, Witkowski is planning to use Tregs to protect transplanted pancreatic islets. He retrieves those islets from a deceased donor’s pancreas and transplants them into “brittle” type 1 diabetic patients whose own islets vanished years ago from the disease. Islet transplantation is a new, alternative procedure to transplanting the whole pancreas. “Instead of a big operation with a high rate of complications, we’re giving patients a similar outcome just by infusing those islets into the bloodstream as a minimally invasive procedure,” Witkowski said. And his patients’ lives have been changed, allowing most of them much better control over their blood glucose levels – and at least half go off insulin injections within five years. 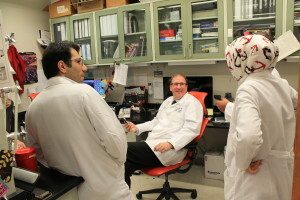 Witkowski’s research team meets in his laboratory. Photo by Sara Serritella. But the doctors still have to use the same immunosuppressant medications normally prescribed after whole organ transplantation to protect the donor islets from being rejected, Witkowski said. So the Tregs and their immunoprotective ability could act as an effective, less toxic alternative because the expanded cells would originate from the bloodstream of the patient. Witkowski said the ITM Pilot Award was one of many necessary pieces that came together to help him apply for the next research stage, as the testing and certification behind clinical grade reagents makes them far more expensive than basic research reagents. His team is currently generating its data and will be applying for approval for clinical trials from the FDA this year. Witkowski, together with a team of diabetologists that include: Louis Philipson, MD, PhD, and director of the University of Chicago Kovler Diabetes Center; Silvana Pannain, MD, Assistant Professor of Medicine; Colleen Flynn, MD, Assistant Professor of Medicine; Tiffany Grant, NP; and a team of nurses from the ITM’s Clinical Research Center (CRC), has been optimizing islet transplantation procedures that Witkowski said he is looking forward to combining with the new Treg therapy. Collaborate with Piotr Witkowski by reaching him at pwitkowski@surgery.bsd.uchicago.edu.